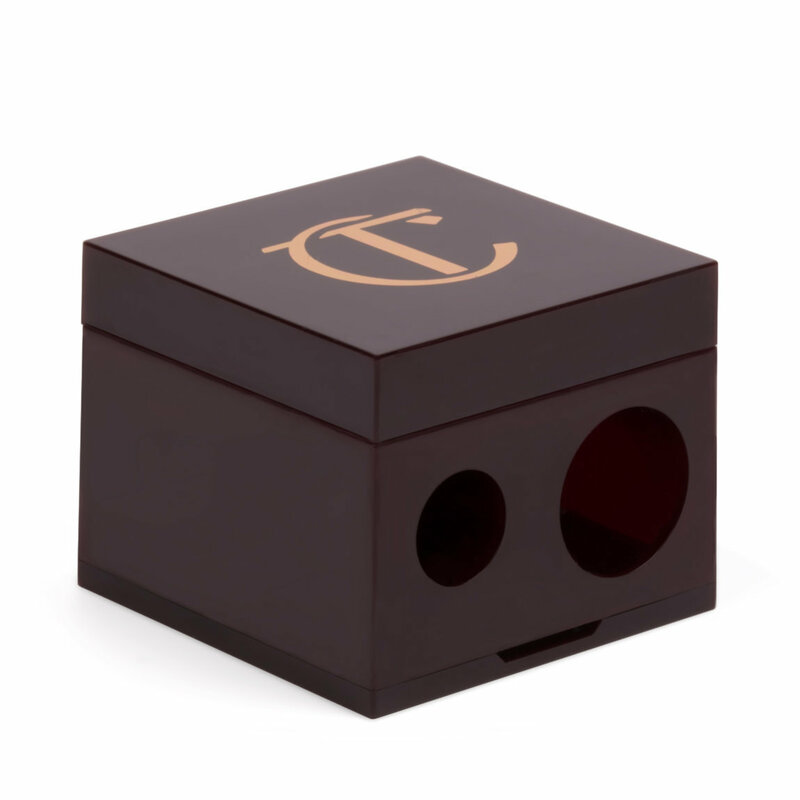 For the best results always keep your pencils nice and sharp with Charlotte Tilbury's Double Cube Pencil Sharpener. Works with Colour Chameleon, Rock 'N' Kohl, The Classic, and Lip Cheat. I live in Australia and bought Charlotte's whole makeup range in New York. I love every product but especially the sharpener, it sits on my make up shelf and it is self sufficient in keeping the shelf clean as it is enclosed. It sharpens all my products 10/10. I bought 3 in case I loose one, I cant live without it. Melbourne Australia. This is a pencil sharpener, and it sharpens things. No, no, don't pass out, it's true. This works for various brands and various pencils. You've got narrow and wider width holes, this allows for some of your chubby stix as well as all kinds of liners. I love the sleek look of it and the color makes it easier to find amongst many things that may be laying out on your vanity. Very good little sharpener you can't go wrong with! When you order the Colour Chameleon pencils you need a fatter pencil sharpener so I purchased this and especially appreciate that it collects the waste. I'm not as wild about it for the regular sized pencils since I have a couple others that work better. I have been using Nars's pencil sharpener for long time. But this one is definite winner. More secure and so sturdy. Really well made makeup tool. Better than NARS. And packaging is just.. so pretty and classic. LOVE IT. I used my Shu Uemura pencil sharpener for years (bought two) but this is the best I have thus far. Keeps your pencils sharp and to a point, even soft pencils like Kajals. Love. Absolutely hands down the best sharpener I have ever used!!! Definitely order it!! I love it! I have been using Shuuemura pencil sharpener for as long as I remembered. However, i have been crazy with Charlotte Tilbury lip cheat lately, the Shu eats too much deep into the lip pencil and i feel i lost quite a lot of product. So I decided to buy its own brand and m surprisingly love it. I use this CT sharpener on my Laura Mericer eyebrow pencil too and it sharpens the pencil into a perfect shape in few turns. I still keep my old Shu though, it is with me over 20 years and been through a lot like my old faithful friend and still no rust and not even bent, the two of them are best sharpener in my opinion. I purchased this sharpener after getting a Rock n Kohl pencil and the pencil was a little too small to work in the sharpener I had from another cosmetic manufacturer. Not only does this sharpener work well with the Rock n Kohl, it does a much better job on my other pencils that my old sharpener! The old sharpener tended to break off the point of the cosmetic pencils which only wasted the makeup and it never gave a good sharp point. The CT sharpener works GREAT with all my eyeliner/brow pencils, provides a good sharp point, and doesn't waste the products. I bought a second one for my travel makeup bag so I never have to be without it. This is just a cute little sharpener that goes right along with CT's Rock & Kohl eyeliner and her Color Chameleon eyeshadow pencils. Very nice and it traps the shavings neatly. Good price as well. I am impressed, I have not broken a tip, eaten away my pencil, a couple of twists and your ready to line your lips! I love this little guy - it is fabulous!